Fresh. That’s the description Chef Henri Chaperont uses to describe the new look at his popular cottage restaurant along Colorado Avenue. Indeed, with sleek new flooring and interior and exterior paint, it does feel more casual and contemporary, lighter and more airy, just in time for summer. Chef Henri is also preparing the beautiful outdoor patio for the bright summer days ahead. Colorado Springs’ preeminent French chef, he’s a long time loyal customer of Ranch Foods Direct. Two featured items on the menu are the New York strip steak and the rack of lamb. 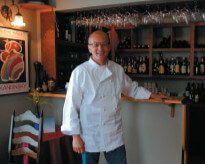 He will continue to offer fine wines and a full bar and to make a variety of lush French desserts daily from scratch. And now he’ll be open for lunch as well. Chef Henri closed the restaurant for a few months before re-opening with the new renovations. He briefly became involved with a downtown business venture currently on hold. “I’m excited to be my own boss again,” he said with a smile. That was how District 11 food service director Rick Hughes reacted to a screening of the film Fresh! shown at Palmer High School last month. “We are eliminating processed foods from our menus. It is a huge commitment. We impact 24,000 lives a day,” he said. He explained how the National School Lunch Program has evolved away from healthy food. The current allocation is $2.88 per meal. With other overhead, even less of that — $1.23 — actually goes for buying food, Hughes said. As a result, food service programs are tightly confined by their budgets. In a district the size of D-11, which serves 3 million meals a year, a one cent difference in food cost adds up to $30,000 annually, he explained. But when D-11 made the decision to terminate their management company contract and move food service in-house, great changes became possible. “We just have to manage smarter and better,” he said.